Nestled in the rolling hills of Ashburn in Loudoun County, Virginia, Belmont is a spectacular golf course community that sets the standard for luxury country club living. This private community offers award-winning homes, unrivaled amenities, and a rich historical tradition. Belmont Country Club is a 1,933 unit gated community that consists of 886 single-family homes, 849 townhomes, and 198 multi-family homes. Whether gathering with old friends, making new ones at the Clubhouse, enjoying an afternoon swim, a late game of tennis, or playing an early round of golf on a spectacular 18-hole Arnold Palmer Signature golf course, you will discover that Belmont Country Club is distinguished by privacy, luxury, and relaxation. The majestic setting of the Clubhouse makes every dining experience a special occasion. Enjoy sweeping views of the golf course from the Grille’s expansive windows or dine out on the patio and savor the view. The Fitness center features a variety of services to meet the lifestyle needs of the entire family. The Fitness center boasts, a fitness evaluation and training center, three swimming pools, and a multitude of activities for adults and children. 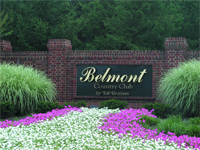 Belmont Country Club currently has 7 Tennis Courts; 3 hard courts and 4 lighted clay courts. Loudoun’s population is the fastest growing of all counties in the United States, and Ashburn itself has over 50,000 citizens. Located within the Dulles Technology Corridor, Ashburn is home to many high-tech businesses. World Trade Center Dulles Airport is currently under construction, Verizon Business has a major office in Ashburn at the location replacing MCI WorldCom’s headquarters after its acquisition. Ashburn is also home to government contractor Telos and AOL maintains its Ashburn location as a satellite office. Airbus Group, Inc., a defense contractor headed by former NASA administrator Sean O’Keefe, has a second location in Ashburn in addition to the main office in Herndon, Virginia. The George Washington University’s Virginia Science and Technology Campus, Howard Hughes Medical Institute’s Janelia Farm Research Campus and Redskins Park (the practice facility for the Washington Redskins), are also located in Ashburn. Middle School students (6th through 8th grade) attend Belmont Ridge Middle School in Leesburg. Students in 9th through 12th grade attend Stone Bridge High School which is located in the northern part of Ashburn Farm. George Washington University and Strayer University also have campuses in Ashburn. Located in Ashburn, Virginia, Belmont Country Club is ideally situated close to the Dulles Tech Corridor, along Belmont Ridge Road between Route 7 and the Dulles Greenway, about 35 miles west of Washington, D.C. Commuters are just ten minutes from Sterling, a growing hi-tech business hub in the metropolitan area, five minutes from historic and scenic Leesburg, the County seat, and just seventeen minutes from Reston, another location for working professionals and businesses. Ashburn will also be home to one stop on the new Silver Line Metro train system. Located between Ryan Road and Loudoun County Parkway off the Dulles Greenway, Silver Line Station Route 772 will provide a speedy commute through the Dulles Corridor to Washington Dulles International Airport, Reston, Tysons Corner, and downtown Washington, D.C.
Belmont’s Manor House was once part of the vast land holdings of Lord Fairfax, and is located at the heart of the community. The Manor Home, listed on the National Register of Historic Places, was built in the 1790s by Ludwell Lee, son of Richard Henry Lee, a signer of the Declaration of Independence. Overlooking the 1,000 acre plantation, the manor house is the crown jewel of this magnificent place. It is situated on the highest point of the property, and when you look out at the stunning views, you can almost see life as it was in the 1800s. One of the most exemplary expressions of Federal-style plantation architecture in the Middle Atlantic region, Belmont Manor House was built between 1799 and 1802. The builder, Ludwell Lee, was the son of Richard Henry Lee, a signer of the Declaration of Independence; and an aide-de-camp to General Lafayette. Often a center of lavish entertaining, the Belmont Manor House hosted many distinguished guests, including Presidents John Quincy Adams and James Madison. In 1836, the plantation was purchased by Margaret Mercer, daughter of former Maryland Governor. Miss Mercer established the home as a school for girls and built Belmont Chapel, renowned as a place of spiritual enlightenment and “the place” for weddings. Other notable owners include Mr. & Mrs. Edward B. McLean. Mr. McLean was the son of the owner and publisher of the Washington Post; Mrs. McLean once owned the Hope Diamond. It was Mr. McLean who brought foxhunting, thoroughbred racing, and other spectator events to the Belmont Manor House.